Sometimes I Amaze Myself! – We Got This! You are here: Home / News / Sometimes I Amaze Myself! That’s right! I sometimes amaze myself. And, by “sometimes” what I mean is “oftentimes”. Some might even go so far as to call me a problem solver (isn’t that right, Sue? You’ll never hear the end of it…). You see, I have no problem tooting my own horn. I’ve practically become double-jointed from patting myself on the back. I have been called “arrogant” (more times than I care to mention) and, dammit-to-hell and back, I wear it as a badge of honor! Seriously though, I did come up with a winning idea this morning that actually is amazingly functional in practice. Toot! Toot! Most of you are familiar with the Medium Nerve Stimulator (MNS) Ryan wears on his wrists for 12 hours a day. It sends electrical impulses up his arm, neck, and into the brain. It’s like someone pestering him relentlessly (You husbands will know what I’m talking about). A random jolt that basically tells him “wake up”. Some days he tolerates this well. Others… not so well. Today is a “not so well” day. The tell-tale sign is he extends his legs each time he gets zapped. In a round-about way, this is worthwhile. His legs get a workout from flexing and relaxing. I was studying him this morning to see if there might be something I might do to make him more comfortable, then I had an idea that ranks right up there with TiVo and the iPhone. Instead of comforting him, why not push him harder? Really make him work. I jumped up, got right in his face, and did my best Arnold Schwarzenegger of “I’m here to pump you up!”. Then I laughed out loud at my humor (hey, I crack myself up — what can I say? ), excited to see what happens. I grabbed some 5 lb. 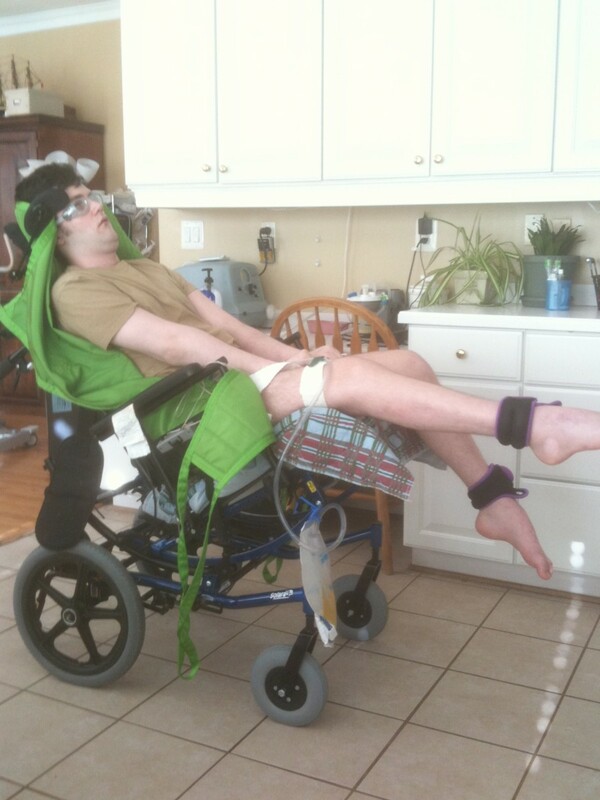 ankle weights and strapped them to his legs. Presto! Resistance training! Using his reflexes to provide resistance training. I must tell you, arrogantly or not, I’m really proud of myself for having the stroke of brilliance that would greatly benefit Ryan. It’s not only good for his leg muscles, but also his knee-joint and bone density. But wait, there’s more! In my simplistic philosphy of “what’s good for the goose, is good for the gander”, I wondered why this wouldn’t also work for the arms (a.k.a., “the gander”). So, I flopped his arms over the side of his chair and waited anxiously for him to get zapped. As I hoped, he lifted his arms. I transferred the weights to his wrists. He is now getting resistance training in his shoulders. The best thing about it is, this will certainly build bone-density in his forearms. I only have the one set of weights. If anyone has 2.5 – 5.0 lbs ankle/wrist weights that they no longer use would you mind letting us have them? This may be the start of something BIG! Thinking of trying this on myself, or better yet, my husband while he’s watching TV — hmmm — Still here. Hey Arnold! Can’t wait to read your post tomorrow that says something like…”and so there were 10-15 sets of weights left on the front porch from yesterdays post, along with a few tubes of BenGay”. WAY TO GO ARNOLD!!!! Record that next time and put a sound byte on here so we can hear!!! But really, in all seriousness, YOU AMAZE ME EVERYDAY!!!!! This is genius, how do you determine when he has exercised “enough”? You amaze me Ken. Ken, I’ve got to say, that was a stroke of brilliance on your part! How do you think of these things? I’m sitting here kind of in awe at the moment — wow — Go Ken!!! Your son WILL prevail… in large part due to YOUR diligence & your family’s diligence! This entry made me laugh and cry; as it is another CLEAR indication of the strength and depth of your love for your beautiful son. GO KEN GO! Ryan has & will reap the rewards of YOUR sweat and tears. Beautiful. Keep up the ridicilously great work!